Worldwide icon-chevron-right North America icon-chevron-right United States icon-chevron-right Illinois icon-chevron-right Chicago icon-chevron-right Asian-chicken-wing smackdown! Trying to pinpoint the traditional components of Korean-style chicken wings is like trying to dissect what makes a classic burger—no two people are ever going to agree. But one thing is certain: yang-nyum tong dak need to be sweet, spicy, salty and crunchy all at once, otherwise they’re just subpar. Luckily there’s no shortage of Korean wing joints around town that have been putting out good wings for decades. But now a handful of newcomers are also offering wings. Here, a guide to wings both old-school and new. We didn’t expect to find Korean-leaning chicken wings at this classy cocktail lounge, but chef Erik Chizeck not only leans on classic Korean flavors for his wings— he also tosses them with cucumber kimchi, which providess a welcome relief from creeping heat. Bill Kim might be of Korean descent, but his latest take on wings actually pulls from Chinese tradition, employing a centuries-old technique of smoking poultry with tea leaves. Wings that have been salt-cured overnight are smoked for about ten minutes. Next, they’re dropped into the fryer to crisp up, then transferred to a hot pan to soak up what Kim calls “Thai butter” (compound butter given Thai flavors via chili sauce, lime zest, lime juice, fish sauce and garlic) plus a splash of nuoc cham, a housemade Vietnamese dipping sauce of fish sauce, lime juice, lemongrass and brown sugar. After years eating Korean-style fried chicken around town, chef Nicole Pederson wondered how good they could be if she adapted the flavors and applied them to top-notch Gunthorp Farms chicken. Turns out, pretty damn good. A Korean friend tipped Pederson off to two rules she employs—use sweet rice flour for the crispy coating and always double-fry—but from there she goes AWOL, brining the bird in buttermilk brightened with lemon rind and green coriander before frying and finishing with a hauntingly complex sauce: meco and morita chilies (both smoked jalapeños), black cardamon, more green coriander, lemon and orange rind, and hefty doses of honey and garlic. One glance at the modern digs of this Wicker Park ramen joint and it’s clear chef-owner Se Jin “Sunny” Yim is not going for traditional (the giant sangria vat on the bar is a clue, as well). But Yim was born and raised in Korea, from where much of his “fried garlic chicken” takes its cues (the double-fry technique, the rice-flour coating). After its second frying, the hacked-up half chicken gets tossed in a garlic-soy-sugar sauce spiked with bonito flakes and almonds. In Indonesia, there are hundreds of varieties of sambal, a chili paste often amended with garlic, shallot, tamarind and/or terasi, fermented shrimp paste. Elice Setiawan, the matriarch cook at Rickshaw Republic, won’t divulge the exact makeup of her masterful paste, but it’s the key to the sweet and sour heat of her signature wings, which are tossed in the paste and then sprinkled with crispy shallots for crunch. 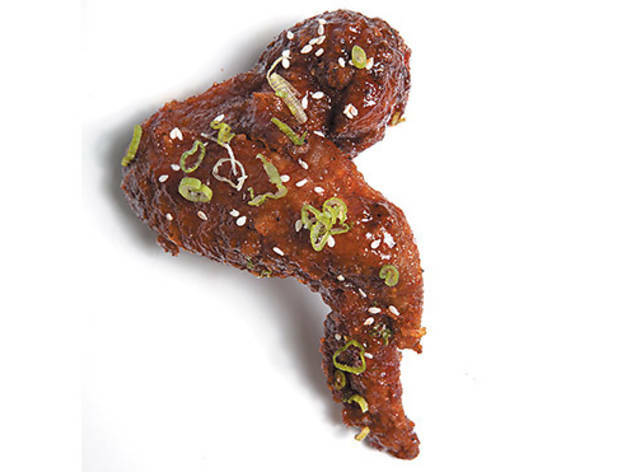 My personal gold standard for yang-nyum tong dak, this teeny Lakeview BYOB diplomatically does Korean wings two ways: Seoul Sassy (ginger, soy, garlic and black pepper) and Crisp BBQ (a thicker, lightly smoky nod to barbecue sauce but built upon gochujang, the ubiquitous Korean chili-paste condiment). Attempting to choose between them is futile, so get a ten-pack and go half and half. A near carbon copy of Crisp, the jumbo wings (pictured) at this family-run Edgewater newcomer are likewise available either soy-garlic or barbecue, and you can also split up a ten-pack half and half. 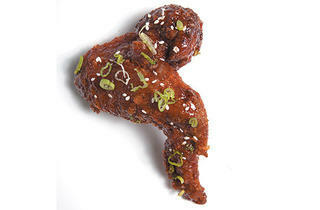 The crunchy coating and trademark Korean flavors are comparable to Crisp’s as well, but the meat isn’t quite as juicy. Sweet service and a streamlined operation offer promise, though. Chinese immigrant Nai Tiao has survived in this Albany Park spot for more than two decades on the strength of his lollipop-like chicken wings, created by hacking off the wing tip, “Frenching” the drumette and pushing the meat and skin down to one end for an easy-to-eat signature. Fried to a crisp and drowned in a sweet-tart-spicy glaze now bottled and sold by the cash register, Tiao’s Korean-Chinese invention is the stuff of legend. Known solely as Hourglass when it was a dive bar on Lawrence Avenue in the ’90s, Ssaboo (also known as Moraeshigae) is revered for its yang-nyum tong dak, done traditionally with whole chicken, a double-fry technique, rice flour and a soy-ginger-chili sauce that takes its sweetness from a hefty dose of mulyeot, Korean corn syrup. Nai Tiao’s daughter Karen Lim dubbed her dad’s wings “Lil Hotties” and opened up this Pilsen outpost for them. When Take Me Out opened, Lim essentially was applying Tiao’s sauce to typical wings to achieve a similar flavor, but public demand soon prompted the second generation to go with Dad’s laborious lollipop technique—and business boomed.